5 Reasons why Answer, Steelcase’s best-selling desk system, is your workstation solution. Most workstations are built like picture frames, where the main structure of a given side, or panel, is one welded piece. If you decide one day you want to lower your panel height, you’ll need to buy an entirely new “picture frame” for your station. Luckily with Answer being built like Legos, you’ll simply need to buy two shorter vertical pieces for your frame, which is far less costly. 2. Power every 12” vertically. Answer’s open frame allows for easy placement of power up and down the frame every 12”. 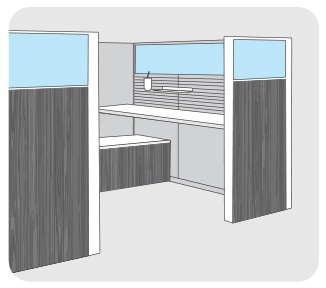 This allows for a high level of planning flexibility, as most workstations only offer power access at the base of the workstation and at desk height. 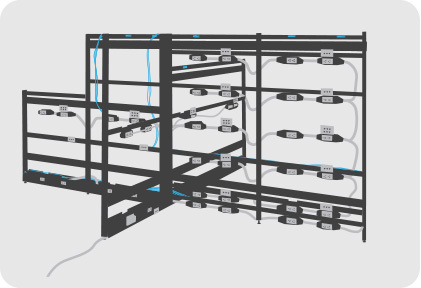 Answer also utilizes the same power kit anywhere on the panel, which simplifies inventory and installation. Skins are tiles that go on the panel of your workstation, which can be made of all sorts of different fabrics and materials serving different aesthetic and functional needs. Dedicated skins are like puzzle pieces: every piece is a designated size bound for a designated spot on the panel. 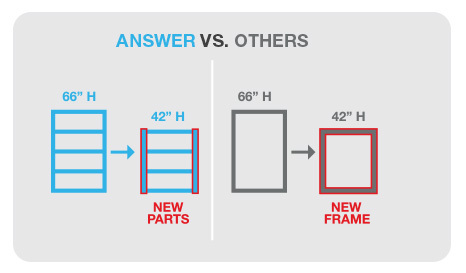 What makes Answer’s skins unique is that they are non-dedicated, meaning that these tiles of assorted sizes and materials can go anywhere on your panel, providing easier and less costly assembly and reconfiguration. If you’ve ever gone camping, you know the difference between a cheap tent and an expensive one. One keeps the water out better than the other, holds its structure better and keeps the tent material in better condition. The same is seen with Answer, as the high-quality, steel-reinforced skins are built to last; you can trust they won’t fall off one day or be dented by someone walking into them. 5. Change from monolithic to segmented skins without added supports. Answer’s skins are attached to their steel reinforcements with factory-installed metal spring clips, offering strength and durability. These allow for easy change from a monolithic to a segmented look and vice versa, without the added costs of additional supports one has with most panel systems. 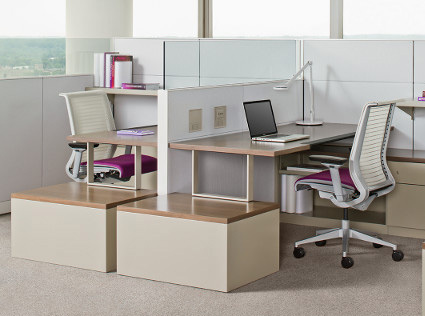 There are many choices in the market for workstations. Like buying a car, a lot of the choice comes down to preference. One thing to remember is that while a sports car and a station wagon both use four wheels, only the former has the inherent quality to maintain its function and wow-factor ten years down-the-road. Networking basics for all generations!